A gift for prayer, worship, meditation, and everyday devotion: Here are 102 beautiful expressions to celebrate the grace of God. 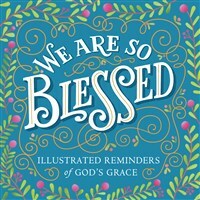 The wisdom of the Christian faith gets a reverent and radiant new treatment in We Are So Blessed, which pairs inspiring words with contemporary, vibrant graphics and gorgeous hand-lettering by 25 artists. Affirmations to soothe the soul and brighten the spirit. Biblical verses from Old and New Testaments. Beloved psalms, prayers, and hymns. Quotations from philosophers and writers, like St. Augustine and C. S. Lewis. Mindful meditations: Inhale faith. Exhale fear—and beyond. And each is made all the more powerful through the transformative lens of art. This uplifting, modern book is a reminder of a timeless truth: No matter where you may be in life, God has blessed you in countless ways. It’s a celebration of His guidance and generosity—and of the devotion and spiritual rejuvenation He inspires.